Recover a legendary Legion artifact and obtain the blessing of Kynareth. Travel to Castle Dour and read the Emperor's letter. Locate the camp southeast of Fort Greymoor and defeat the Alik'r mercenaries. Take the key from Majid and recover the cursed Lord's Mail. Go to Kynareth's shrine at the Temple of the Divines to claim the Lord's Mail. Once you've installed the Lord's Mail Creation, you will receive this quest and be directed to Castle Dour in Solitude to intercept a letter from the Emperor. The Letter to General Tullius can be found on the ground floor of Castle Dour. You are only required to read the letter to progress the quest; taking it counts as theft, so be sure that you are not seen if you decide to take it with you. 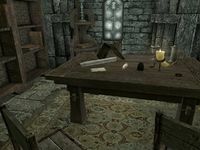 The letter reveals that the Lord's Mail, a legendary Imperial Legion artifact, has been stolen by a band of Alik'r mercenaries who were last seen south of Fort Greymoor in Whiterun Hold. The Alik'r camp is actually located southeast of Fort Greymoor, and is home to two generic Alik'r mercenaries led by Majid the Mad. Taking on all three at once can be a tough fight, so prepare accordingly. Once the mercenaries lie dead, recover the Key to Alik'r Mercenary Chest from Majid's body and use it to open the nearby chest. Inside, you will find a cursed version of the Lord's Mail along with a set of instructions titled Majid - Please Read. The note warns that the cursed armor should not be worn; indeed, if you equip it you will be subjected to a constant 50-point reduction to your Health, Stamina, and Magicka. In order to remove the curse from the Lord's Mail, you will need to seek the blessing of its mythic creator, Kynareth. This will necessitate a return to Solitude to visit the Shrine of Kynareth in the Temple of the Divines. Upon activating the shrine, you will be informed that "The Lord's Mail has been cleansed". This concludes the quest and rewards you with a set of heavy ebony armor with poison resistance, magic resistance, as well as a unique area effect that inflicts 5 points of health absorbance per second on nearby opponents. For the purpose of the Matching Set perk, it counts as Imperial armor. For historical information on the Lord's Mail, see the lore article. The Alik'r mercenaries wear unique Redguard clothing items. 0 A letter from the Emperor pertaining to an Imperial artifact was found at Castle Dour. I should read it and find out what it's about. 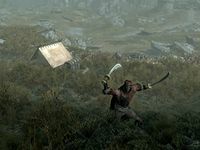 10 I've found a letter addressed to General Tullius from the Emperor of Tamriel instructing that The Lord's Mail, a treasured Imperial relic, be found and reclaimed. A band of Redguard mercenaries are rumored to have taken it. I should locate their whereabouts and see if I can obtain the artifact. 20 I've retrieved The Lord's Mail, the legendary Imperial armor. Before it can be worn, it must be cleansed at the shrine of Kynareth in Solitude. 30 Finishes quest The Lord's Mail has been retrieved, blessed by Kynareth, and can now be worn safely. On the PC, it is possible to use the console to advance through the quest by entering setstage ccBGSSSE021_LordsMailQuest stage, where stage is the number of the stage you wish to complete. It is not possible to un-complete (i.e. go back) quest stages, but it is possible to clear all stages of the quest using resetquest ccBGSSSE021_LordsMailQuest. This page was last modified on 6 August 2018, at 14:10.